Park Hotel Kailaka in Pleven, Bulgaria. Book hotels and accommodation in Pleven. 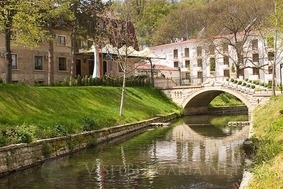 Location: Park Hotel Kailaka is situated amidst the picturesque park Kailaka, nearby the city of Pleven. The hotel is suitable for business meetings, seminars and conferences, as well as for vacations and holidays. The four star complex offers 6 single rooms, 60 double rooms, 35 apartments, 10 luxurious apartments with individual sauna, 1 presidential apartment, conference hall with capacity for up to 200 people and another smaller conference room for 70 persons. The restaurant of the hotel can accommodate 120 people. Another two banquet halls are appropriate, respectively for 50 and 30 people. The summer garden of the hotel welcomes 200 people. The hotel also offers indoor and outdoor swimming pools, SPA centre and guarded parking lot. SPA centre: The spa centre of the hotel offers great variety of relaxing procedures and massages, solarium, several different tipes of saunas, Jakuzzi, indoor swimming pool and fitness hall. Restaurant Kailaka offers wide variety of delicious cuisine and is one of the best restaurants in the city.